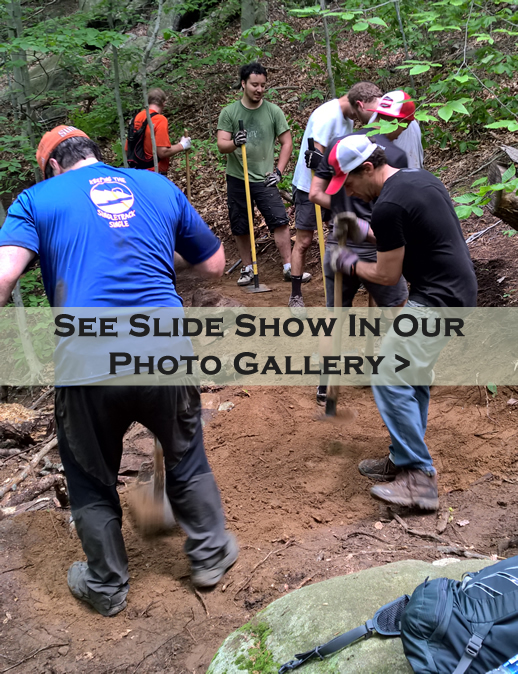 On Saturday, June 3rd, volunteers from the Fairfield Chapter of the New England Mountain Bike Association (FCNEMBA) and the Friends Group, rerouted the Drop Off Trail, to avoid steep sections subject to erosion. 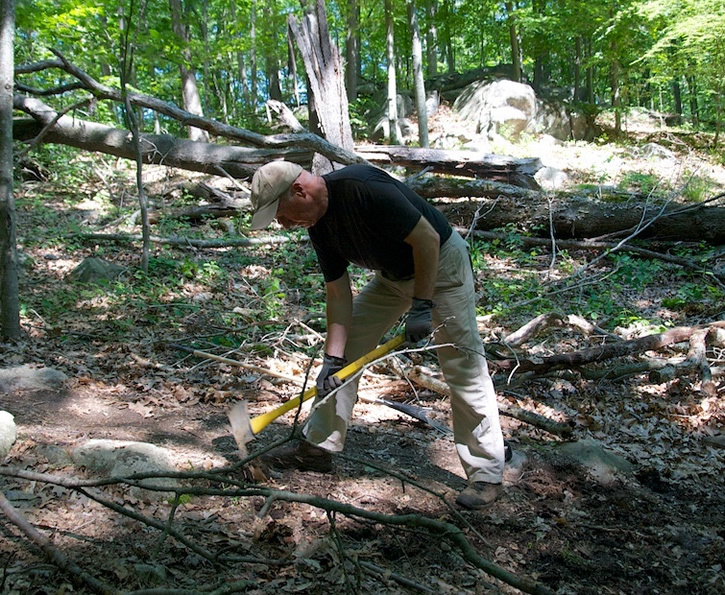 FCNEMBA does trailwork in many parks in Fairfield County, where mountain biking is allowed. 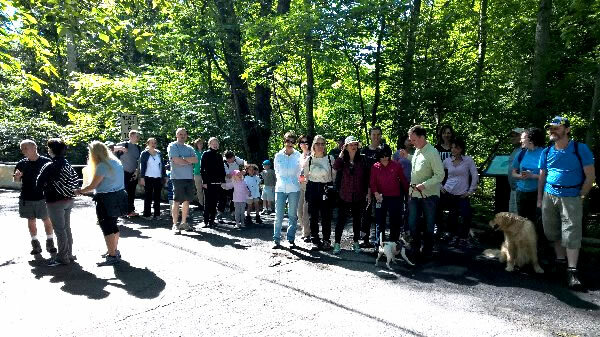 On Sunday, June 4th, Pete Sofman, certified AMC (Appalachian Mt Club) hike leader and President of the Friends of MRP BOD, led walkers around the 4 1/2 mile yellow-blazed loop. 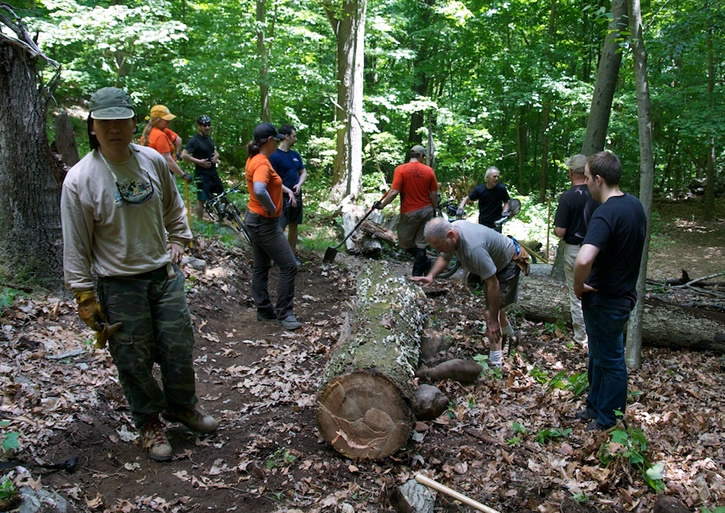 On Saturday, June 4, around twenty volunteers from the Fairfield Chapter of the New England Mountain Bike Association (FCNEMBA) and the Friends Group, rerouted an eroded section of the Indian Rock Trail. After hours of heavy work, the old section was replaced by a sustainable trail, which should last for many years. 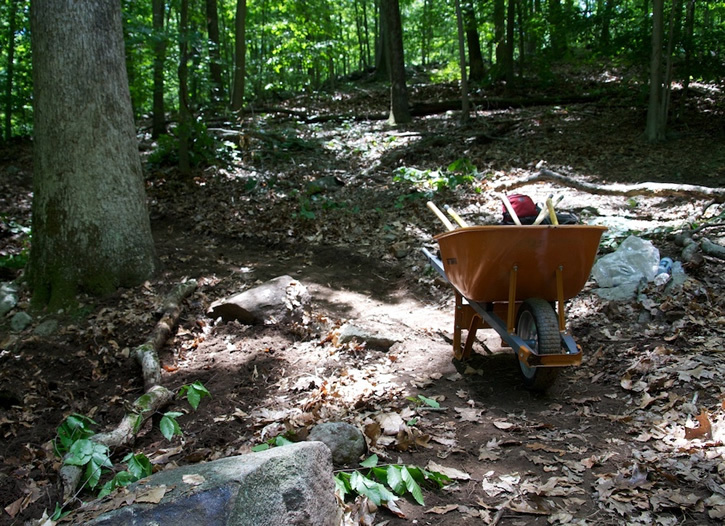 FCNEMBA and the Friends Group have worked together for several years to make major improvements to the trail system in the park. Following a very productive trails work party on Saturday, June 4, the Friends Group continued to celebrate National Trails Weekend, the biggest national trails event of the year, with a family hike in the park on Sunday, June 5. 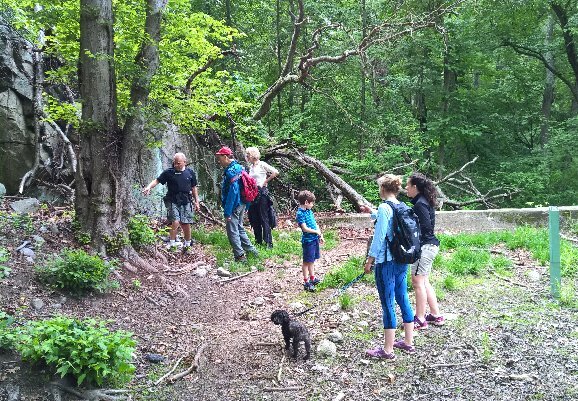 Despite a forecast of rain and thunderstorms, a group of brave hikers joined Friends' board members Pete Sofman and David Roberts for a three hour walk around a number of the lesser known trails in the park, finishing just ahead of a downpour. National Trails Day / Weekend is the biggest celebration of trails in the country with thousands of trail- and park-related events nationwide. The Friends group participated in the celebrations with two trail related events in Mianus River Park. 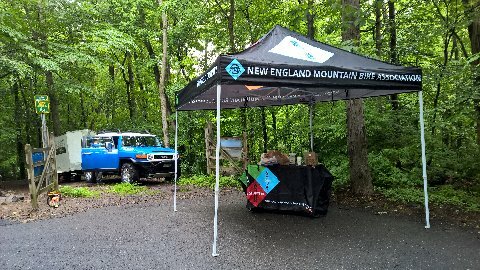 On Saturday, June 6, fourteen volunteers from both the Fairfield Chapter of the New England Mountain Bike Association (FCNEMBA) and the Friends Of Mianus River Park (FoMRP) rerouted a difficult section of the West River Trail in Mianus River Park, close to the Stamford entrance to the park. On Sunday, June 6, hike leaders Pete Sofman and David Roberts lead 40 hikers on a moderately paced hike of about 6 miles on a variety of trails throughout the park. At the entrance to the park, FCNEMBA set up a canopy for refreshments, and the FoMRP had a table with information and maps for park users. 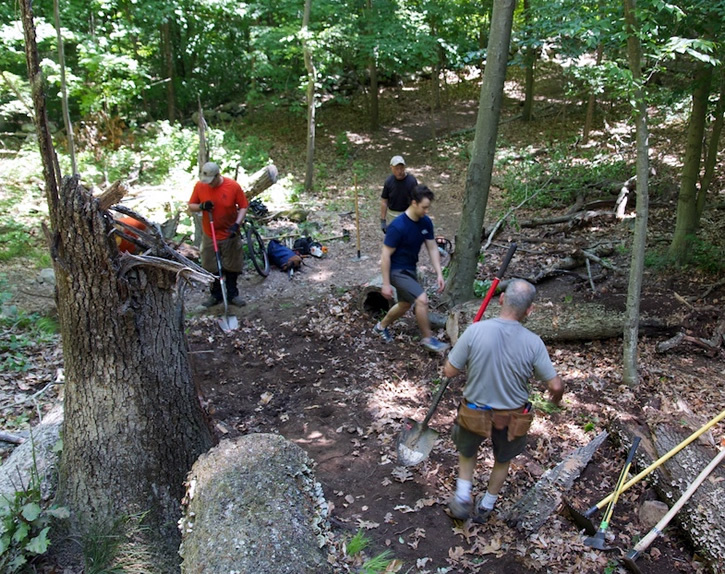 On Saturday, fourteen volunteers from FCNEMBA and the Friends Of Mianus River Park (FoMRP) combined forces and rerouted a difficult section of the West River Trail, close to the Stamford entrance to the park. The trail's new entrance is located about 20 feet before the wooden gate to the Park. Previously the trail had been steep and badly eroded. The new trail is longer, more gradually sloping and designed to be significantly more sustainable. 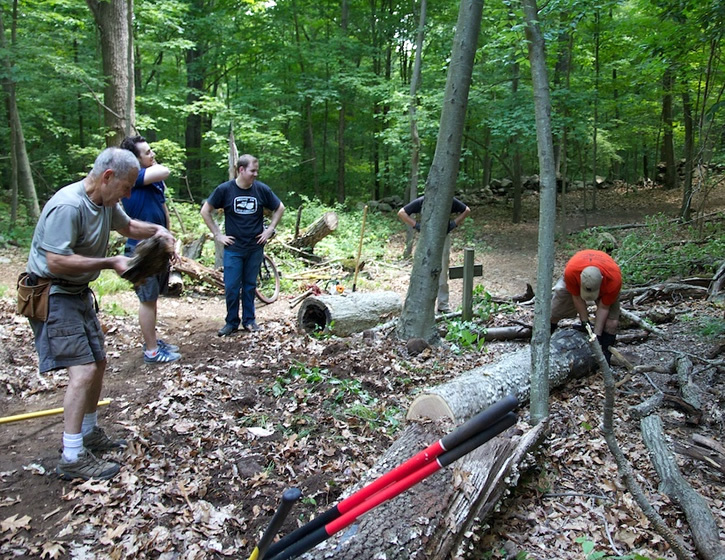 In addition, volunteers cleared a large area of invasive plants, which were then used to block the old trail and restrict access to unofficial trails. On Sunday, Friends board members Pete Sofman and David Roberts led almost forty people in two groups on hikes along many of the trails in the park. 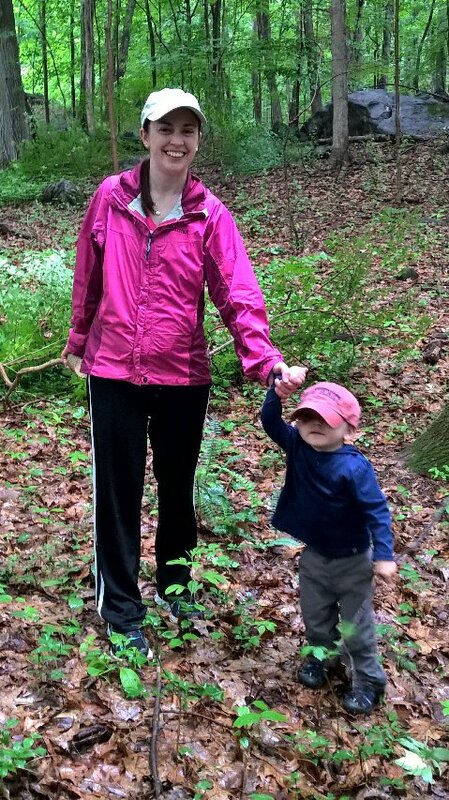 The hike was sponsored by the Friends and by the Appalachian Mountain Club (AMC). The group included 9 children and a selection of dogs. National Trails Day / Weekend, which this year was on June 7 and 8, is the biggest celebration of trails in the country with thousands of events nationwide. 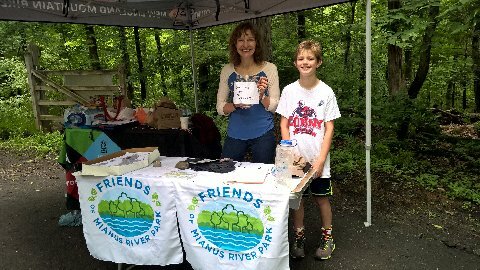 The Friends group joined the celebrations with two trail related events in Mianus River Park over the weekend. 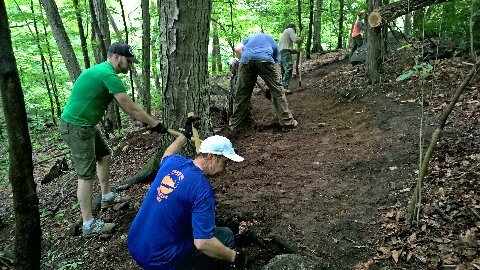 On Saturday, June 7, Friends group volunteers joined a team from the Fairfield Chapter of the New England Mountain Bike Association to reroute and improve a section of the Hill Trail. The section had run straight downhill making it susceptible to erosion but after some heavy work by about ten volunteers the section is now contoured and sustainable. On Sunday, June 8, Friends group president David Roberts led a hike of about 6 miles around the perimeter. This event was sponsored by the Friends group and by The Appalachian Mountain Club. 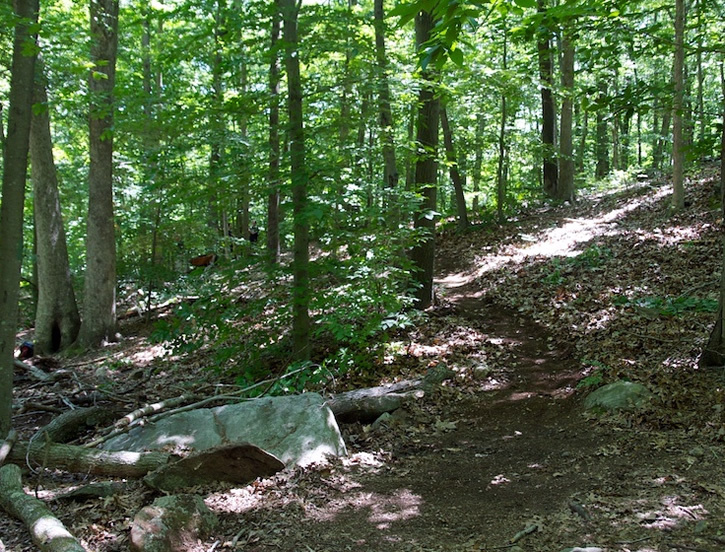 June 2, 2012 was National Trails Day. Did you have a chance to visit our favorite park then? The Friends took the opportunity to set up tables at both the Stamford (Merriebrook Lane) and Greenwich (Cognewaugh Road) entrances to the park to greet park users and invite them to become involved in improvements to the park. 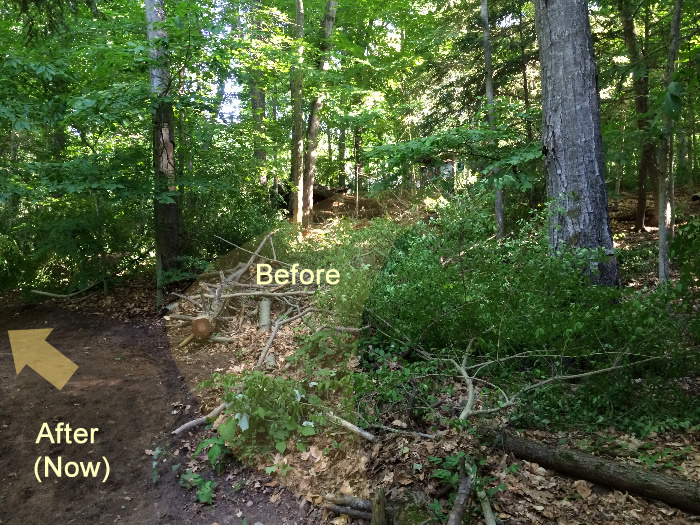 At the same time, trailworkers worked on the lower end of Hill Trail to reduce surface run-off from causing erosion. 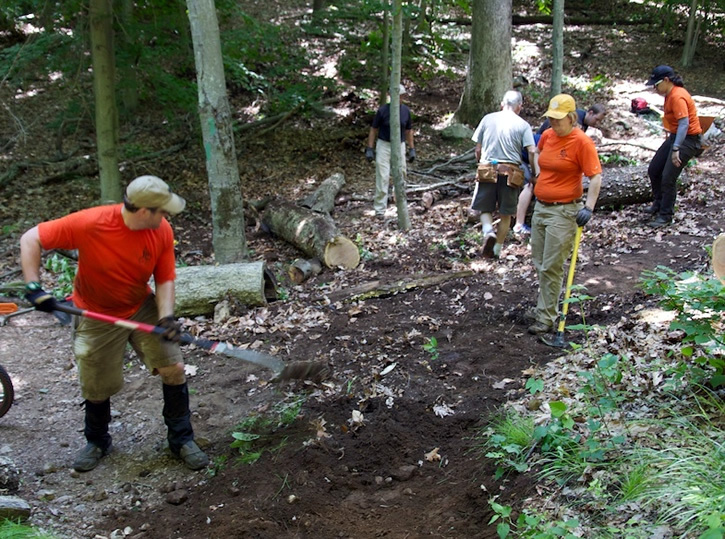 Additionally, Boy Scouts worked on narrowing the Meander Trail, to reduce the compacted areas on either sides of the trail to allow re-vegetation. And finally, a tour of the Park trails was held on Sunday, June 3rd, co-sponsored by the Appalachian Mountain Club. "National Trails Day, which this year was on Saturday June 4, is celebrated across the country with hundreds if not thousands of hikes, trail work parties and other events. 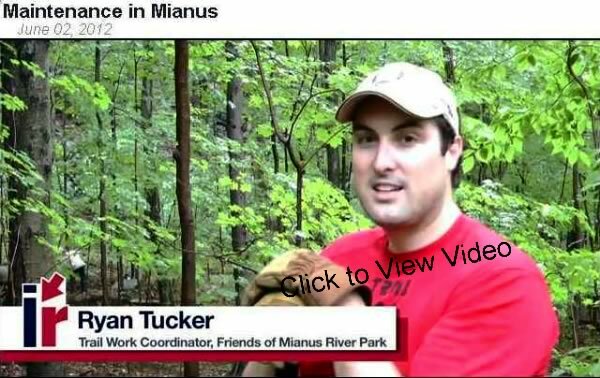 The Friends of Mianus River Park organized three events in the park for that day and one for the next day, Sunday June 5. 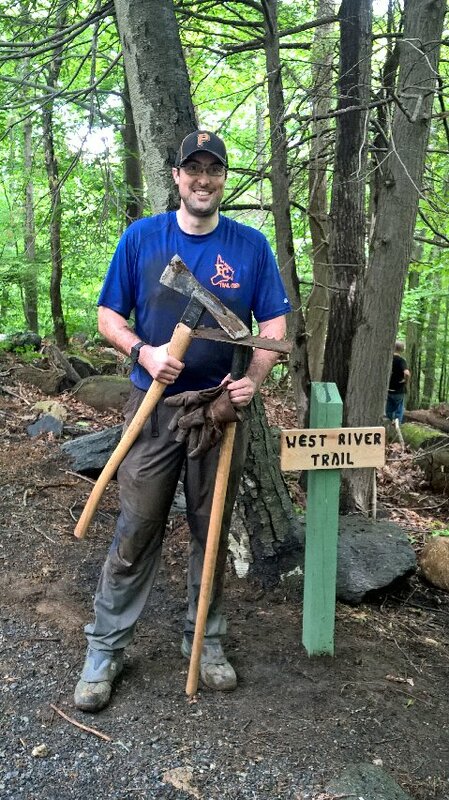 Ryan Tucker, the President of the Friends group, led a trail party to improve a section of the New Trail, which was suffering from serious erosion. On the first Saturday of each month volunteers meet at the bridge near the Red Barn at 9 am to work on trails in the park. 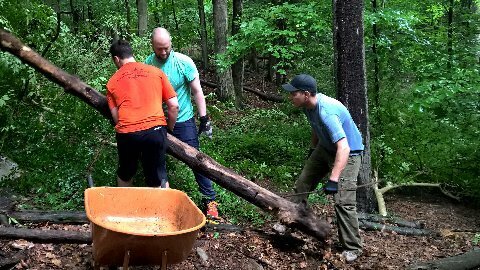 For National Trails Day this regular group of volunteers was supplemented by a group from Greenwich Associates and as Ryan explained this allowed them to get a "huge amount of work done." Friends group volunteers also manned tables at both the Stamford and Greenwich entrances to the park, giving out free maps of the park, explaining the aims of the Friends group, collecting names and email addresses of those interested in receiving updates about the park, and for the first time signing up new members of the Friends group. Park users showed encouraging interest and a number joined the group. Funds raised will be used for park improvements. On Sunday, June 5, Friends' group volunteers Pete Sofman and David Roberts led a hike in the park, which introduced participants to some of the less well know trails and hidden corners of the park. In addition to the regular trail work on the first Saturday of each month the Friends group plans to organize other events in the park on an ongoing basis. On Saturday, June 5th, 2010, the Riverbank Restoration project was completed with the addition of a deer fence and the planting of numerous native plants for soil retention. as well as numerous volunteers from the Friends of the Mianus River Park. 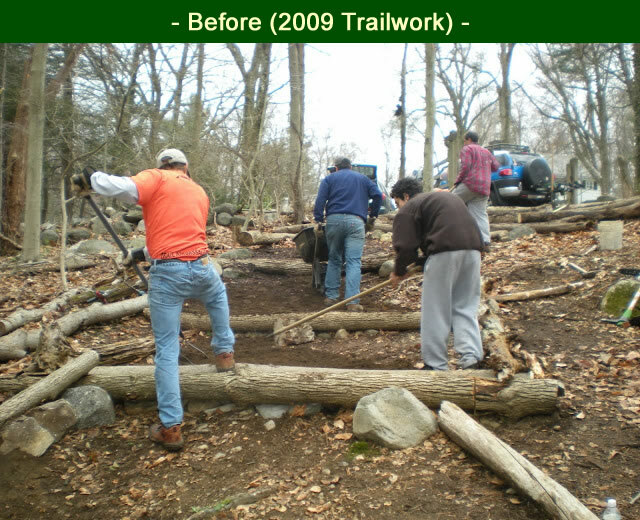 CT NEMBA's Trail Bosses, trained in the latest sustainable trail maintenance and building techniques, led a diverse group of volunteers in reclaiming and rehabilitating a large section of the Meander Trail.The trail had lost its definition, becoming 20 feet wide in some places, due to the flooding and users avoiding muddy problem areas. 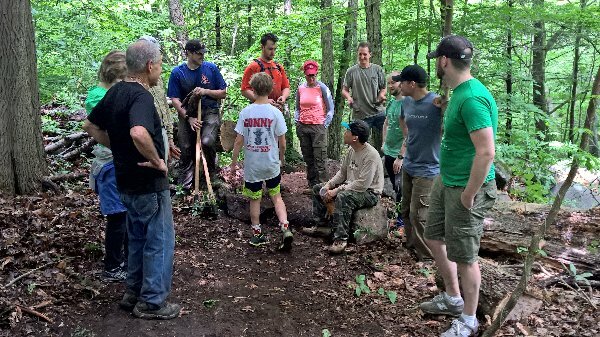 Volunteers isolated the trail using deadfall branches and gargoyles, strategically placed rocks to protect the sensitive natural under-story surrounding the trail, as well as rock armoring to rehabilitate several perennially muddy sections of trail.